The House of the Dead 4 sold so well on PSN, that it managed to jump up on the #5 spot on the PSN Best Selling chart of April. I would like to give thanks to all the HOD fans who purchased this great arcade shooter after waiting seven years for a home port and both Oda and Yas for making such a cool game. Continue to support Sega by purchasing III and 4 on the Playstation Network for only $10 each. 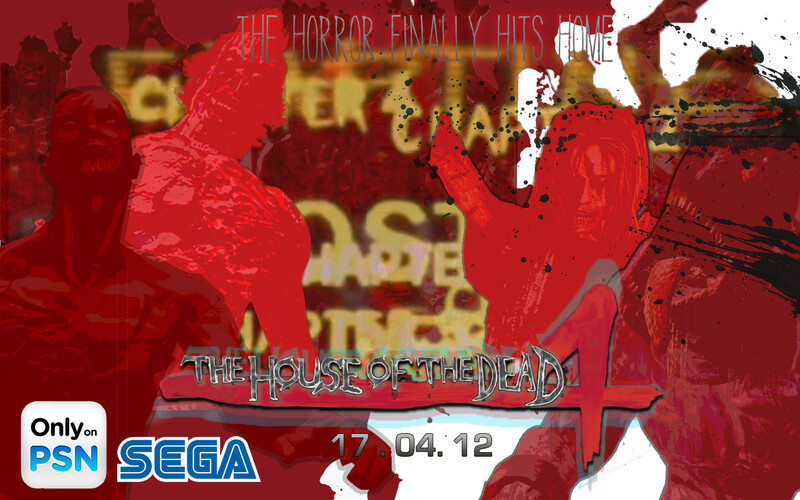 Now how about porting the first game and Loving Deads: The House of the Dead EX, Sega AM1? 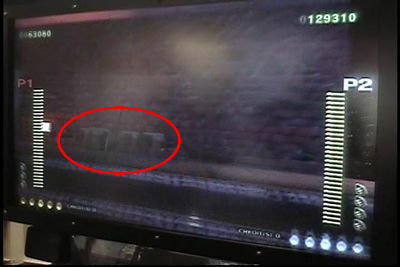 Sega had a contest on HotD 4 not too long ago where readers must find out how many grenades are in this picture. 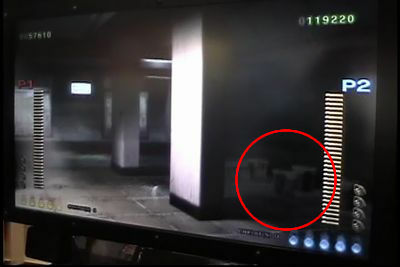 In case your wondering, there are a total of 16 grenades in this picture. Congradulations to the following readers who’ve earned the prizes. 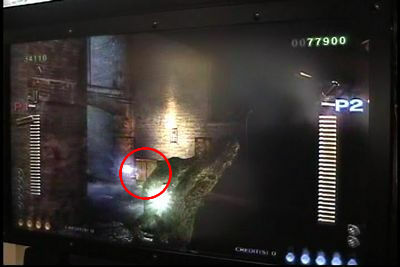 After you’ve destroyed the first wave of creatures, James/Kate will look at their left. 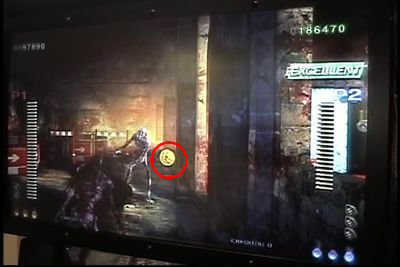 Shoot the danger panel and earn a coin. 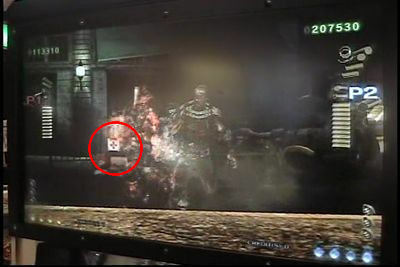 It may not appear sometimes in that one spot and may switch to the other panel in some playthroughs. 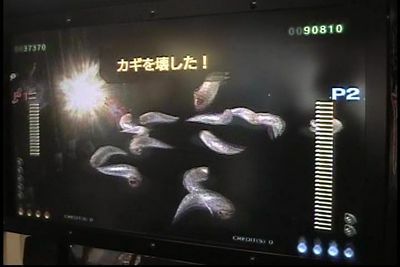 After you’ve obtain the first coin, a creature will attempt to grab you. Shake your gun and shoot to your bottom right. There should be another coin in the box container. 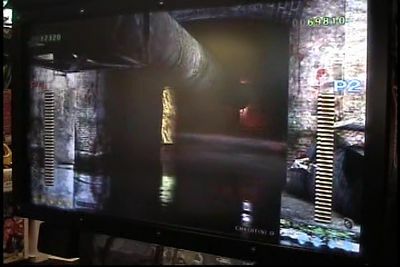 Before the Rubin type creatures show up in this part, shoot the danger panel on the left corner to earn a coin just in case if it doesn’t show up on the first panel. When there are 3 waves of creatures surrounding you and the game tells you to use a grenade, don’t use it and shoot the red switch in order to take an alternate path. Once the waves of creatures are killed off, leave at least 2 of them to save time to get a item in that box container. 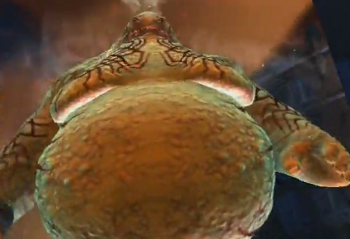 Once you’ve taken the alternate path, you will encounter Zobio like creatures. 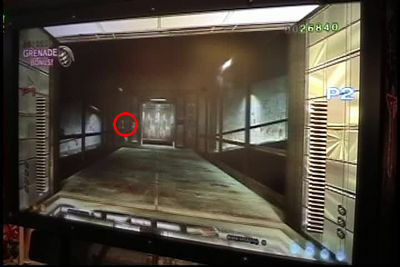 Shoot the door on the left before killing them. 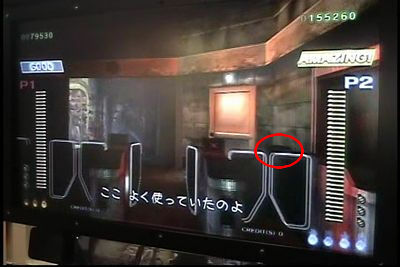 There is a secret bonus room with 3 coins and a golden frog which will also nab you the “BONUS EXPLORER” trophy. 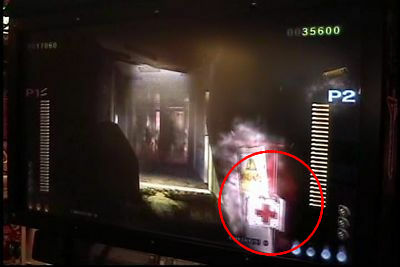 After getting the goodies in the bonus room, there is another danger panel with a life bonus. Be careful as a Zobio type creature will grab you. Shake him off and obtain the life bonus. Now you have to choose a path. If you take the left path, destroy the 4 Rubin type creatures and 2 Zobio creatures should come out the slide door. Immediately shoot the danger panel the lower right and earn the top hat. 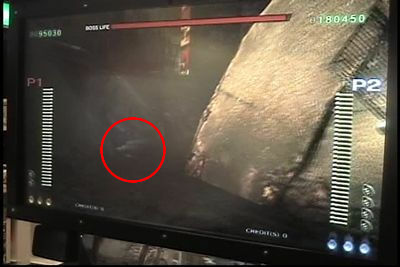 Before the cutscene where they show a HUGE amount of creatures below the building. 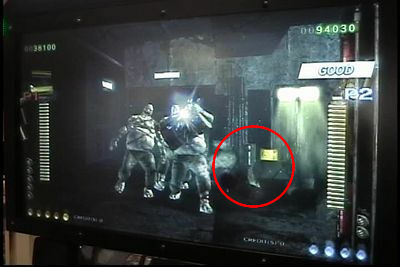 Shoot the yellow box which contains a gold coin. 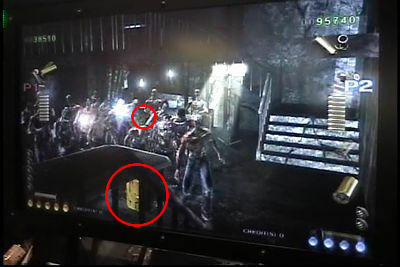 Clear off the creatures for room and shoot the yellow box to obtain a grenade bonus. Towards the end of the chapter as you enter, shoot the danger panel on the right for a life bonus. Afterwards, creatures should be able to come out from the slide doors. 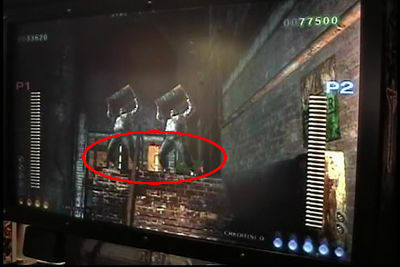 Throw a grenade on your right to enter another bonus room which contains three coins, a top hat, and a bell. Keep shooting the bell to build up the score. After killing off a group of Ebitans, you will encounter 3 frog type creatures. 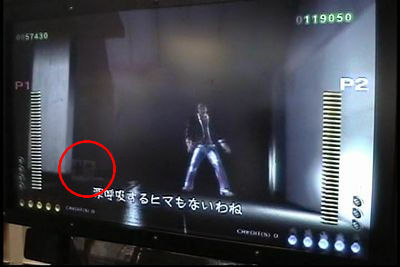 Behind them is a box containing a coin. 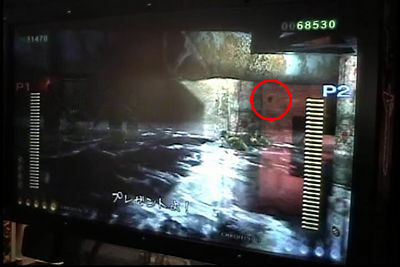 In this part, there is a secret cave. As the group of Ebitans and Frog creatures prepare for an attack, throw the grenade to your right in order to enter the secret cave. The cave of hope shall open. You have an option to make a path. 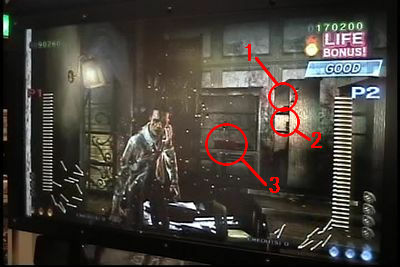 Choose the left one and you should be able to obtain a life bonus in either one of the boxes or barrels. 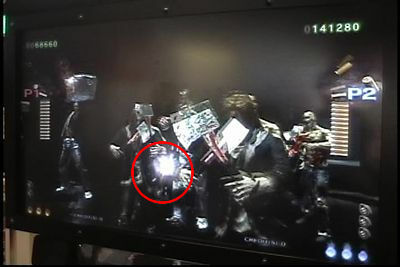 I’m not sure about this part, but there maybe a item in one of the green containers behind the Bob creatures. 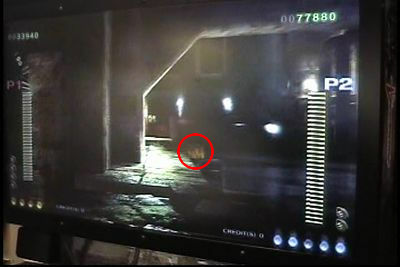 Shoot this box before you encounter varies types of creatures which contains a grenade bonus. Once you’ve encounter and destoryed them, there is a box before you climb the latter. The box should contain a golden frog. 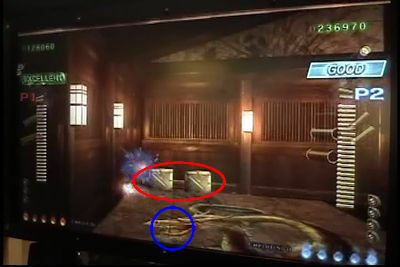 Before you enter the room of creatures in cages, shoot the bottom left floor to obtain items in another secret bonus room. 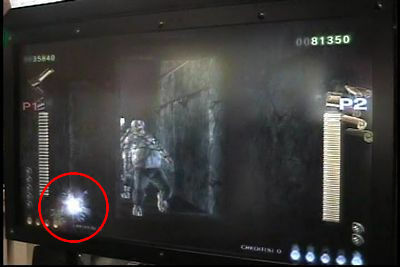 You can take an alternate path by shooting the lock where you encounter a swarm of Murrers. A good scientist once said “Quick! Open the LOCK!” Once you’ve taken that path, shoot the green barrel for a life bonus. You will encounter 3 Bob type creatures. 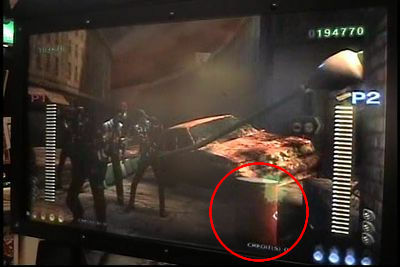 Shoot the green barrels on your right to get a grenade bonus. 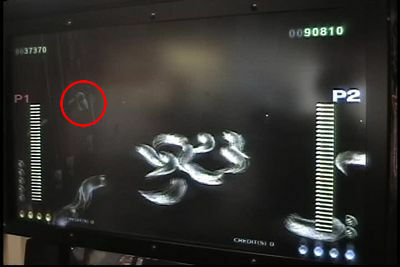 The red circle up top is the location of a coin in the box. Clear some space by shooting the yellow barrel that will destroy some creatures along the way. Do not shoot Bob. This will be your chance to get some good head shots on these creatures to raise your score. Your close towards the end of this chapter. You will encounter a good amount of Burners and Ebitans. This will be your chance to earn yourself the “CUT THE WIRE” trophy as long as they are on the platform. 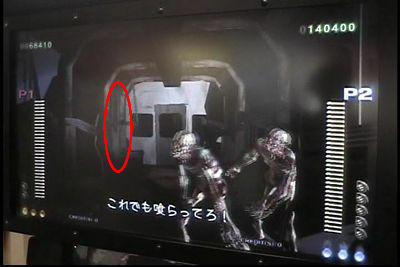 In the beginning of chapter 3 after destroying groups of Kageos, there are boxes as you climb the latter. Shoot quickly though as this maybe your only chance to get some bonus items. If your unable to get it the first time, there is still hope. 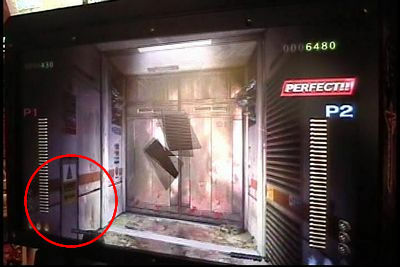 Shoot the boxes quickly to earn a coin before you encounter Ebitans coming from garbage disposals. 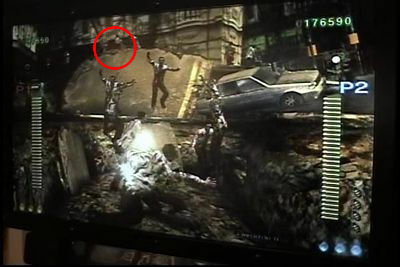 Leave one zombie alive to give you time to earn a grenade bonus to your left in a gallon of paint. Not done yet, there’s a golden Magician in one of those gallons to your right. Watch out for the short zombie creatures and there fierce knife attack. 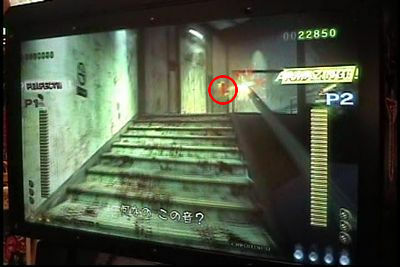 During this moment of the game, a legless Kageo will pop out and drag you to a room. 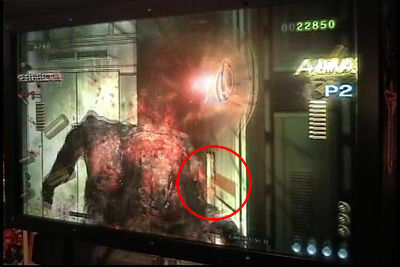 Do not shake your gun and let it drag you in the room. 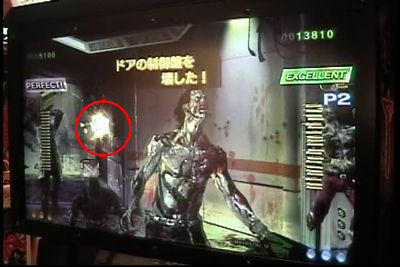 Once your in the room, kill the legless Kageo and shoot the box on your left. The box contains a golden bell. 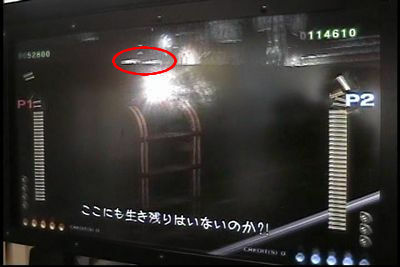 In that same room, you will encounter a group of Kageos. 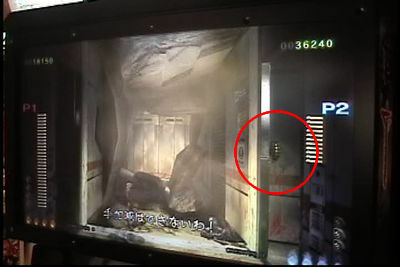 Shoot the box on your right to obtain a coin. After you’ve dealt with the barrel throwing zombies. Shoot the gallon of paint here to obtain a life bonus. 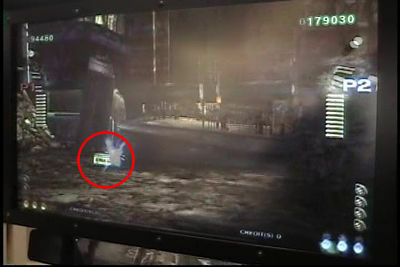 Shoot the control box to your right as you destroy the bats in your way. The room should light up. Before you can get the goodies in the room, you must elimate the swarm of Kageos. When selecting a branch, choose the left route. Down stairs on the far left is a trash bin containing a silver coin. 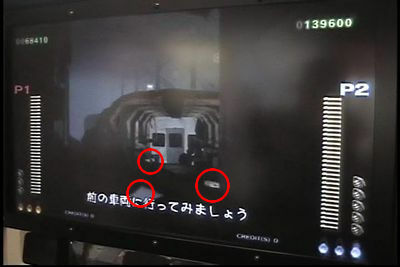 On the second part of the train, there are three containers containing a top hat. To destroy the doors of the cul-de-sac next to the vehicle. 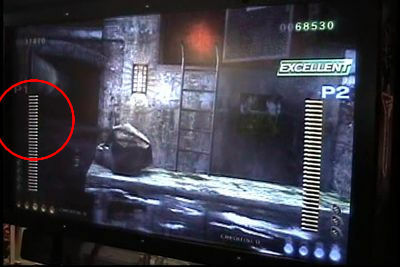 Directly aimed at the door and earn the grenade bonus. 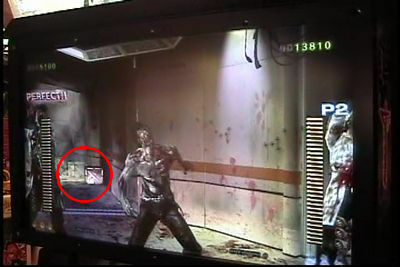 When your surrounded by Johnny and Sam type zombies, shoot the box behind them for a life bonus. 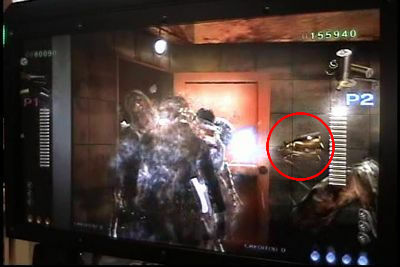 At the start of chapter 4, shoot the Johnny creatures and the container with a golden frog inside on your right. It’s best to get it once you pass the door when upcoming creatures come from behind it. 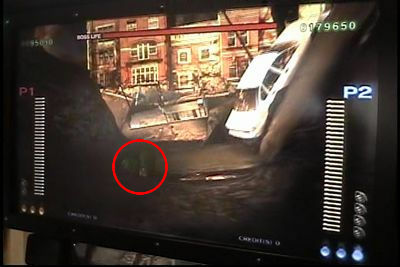 After the cutscene where the sandman looking creatures throw a plastic model out the window, there is a red box under one of them which contains a coin. 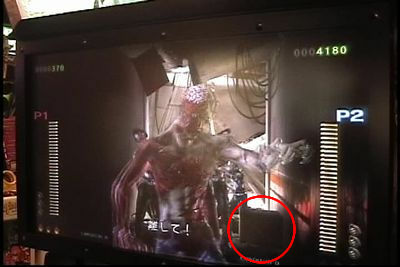 Shoot the sandman like creatures to prevent it from closing the shutter for there are a few red boxes. 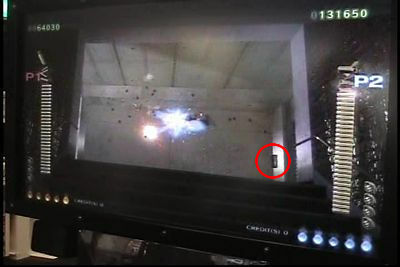 Kill off the remaining wave of creatures and shoot the boxes for a grenade bonus. 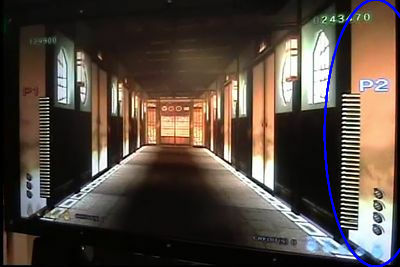 Once you’ve entered the room, shoot the left side where the blue is circled around asap. 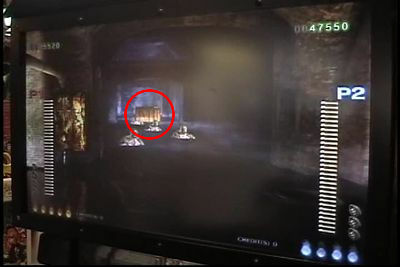 Doing that will activate a secret room containing three coins and a grenade bonus. A life bonus should show up in this part when the creatures crash through the windows. Once your outside in the ruins of Venice, shoot the box uptop that contains a golden Magician. Keep your aim steady, that little thing is a bit fast lol. After earning that golden Magician and destroying the lab coat zombies. There is a next wave of them coming for you. Immediately shoot the green oil drum that contains a bus. Keep shooting it down and earn yourself a huge score along with the “SHOOT THE BUS” trophy. As the Temperance chases you through the ditch. You will see a green oil drum that my contain either a top hat or coin. Cancel Temperance second attack for the next portion of the chase and then you should be able to find another oil drum containing a coin. 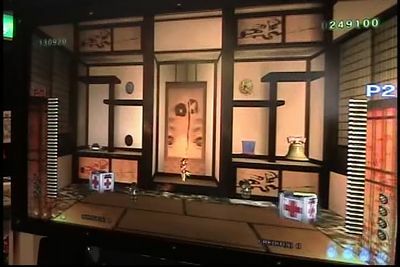 Once your inside the second story of the tower before Temperance crashes in, shoot one of the containers for a golden bell. 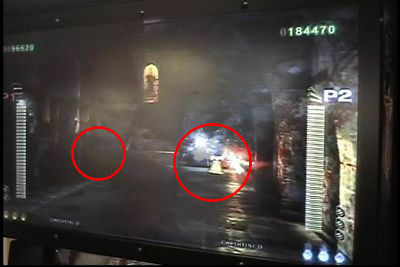 Location varies in some playthroughs. 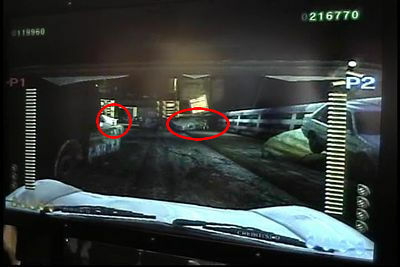 There is a barrel near a couple of AMS and regular zombies as you drive. Shoot at your right to obtain a golden frog. As a group of AMS and horde of creatures come after you in your car. 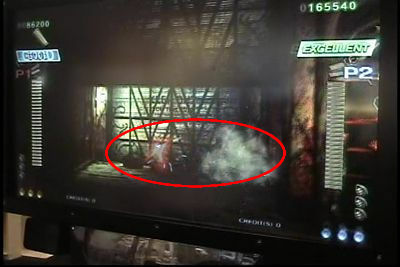 Shoot this red barrel to earn yourself a grenade bonus. 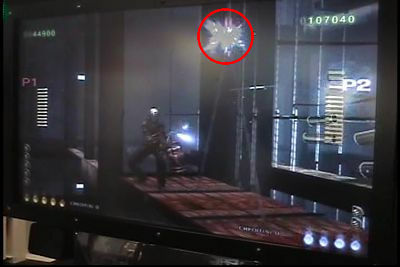 After the grenade bonus, you will encounter sandman type creatures. Shoot the red barrel on your left for a life bonus. This maybe tricky to get. As you drive off before entering the drive through quickly shoot the red barrel circled as above to earn a golden Magician. 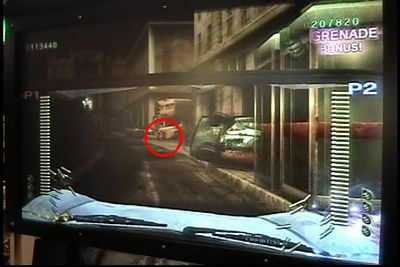 After you shook off the car from making you crash, you can see 2 coins, a top hat and life bonus. Aim percisley. As you enter and eliminated the Franklin 2.0 creatures in Goldman’s new decorated room. One of these boxes contains a life bonus. 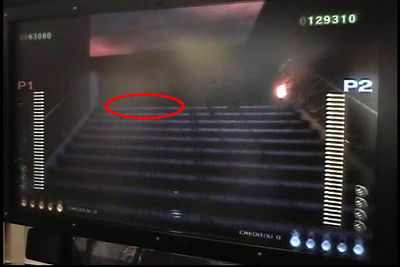 Don’t forget to shoot the dragon’s mouth on the floor to enter a secret room. You just hit the mother load. As for the very last room. You must not lose a single credit in order to enter this room before entering Goldman’s office. I hope this guide helps out a lot of HOTD 4 players. 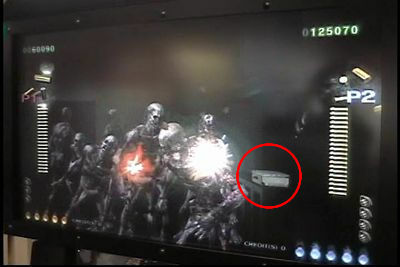 Enjoying The House of the Dead 4, but having trouble getting certain trophies? Look no further! I have made a guide on how to earn these hard earning trophies. Some maybe easy, but others can be tricky to obtain. 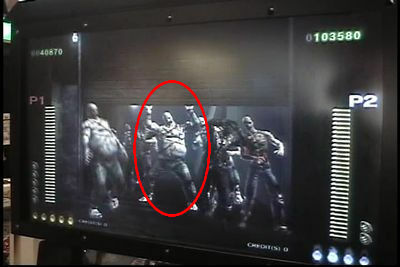 See all 4 endings of The House of the Dead 4. The hardest trophy of them all. This may be a little of use,but this is how I was able to get all 4 endings from my personal playthrough. 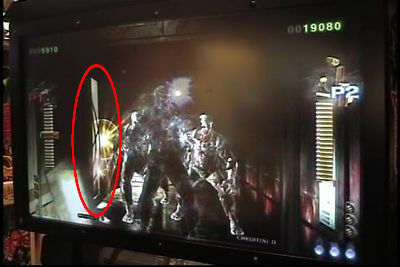 Goldman: Started at chapter Two and beat the game, it didn’t count the first chapter grade. GoldmanZombie: I had Five As and One B and got this ending. G Ending: Get all A’s in every chapter. You can lose a credit a couple of times. Mystery man: This one I’ve earned playing two player mode with my brother only losing credits twice and having five A’s and one S in the sixth chapter scoring about Two Hundred K. Two player differs from single player scores. Get RANK 2 or above in Final Result. A easier way to get this trophy is to play HOTD4SP and earn A or above in both chapters. 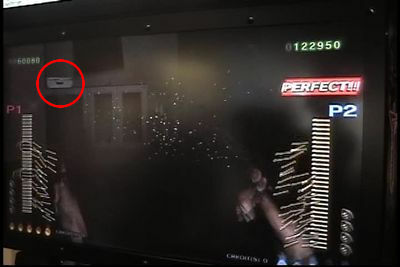 Remember to get in some good accuracy and “PERFECT” Headshots. 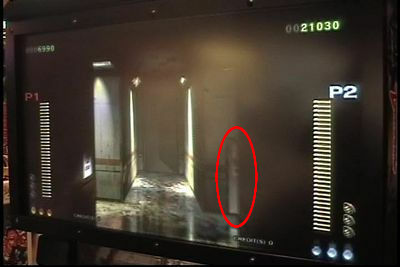 f you guys are having trouble getting the mystery man ending in HOD4SP. You have to set the game on very easy and score about 70000 without losing a credit. I tested it out twice after the first time I got it and it works. 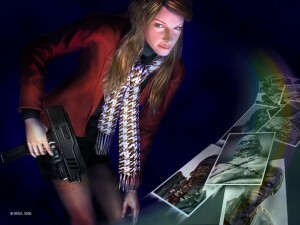 First time was S/A as Top agent and then S/S as Special agent. 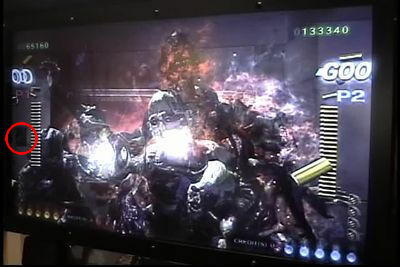 In Chapter 1, shoot the red box while your surround by waves of creatures to go to the alternate path. 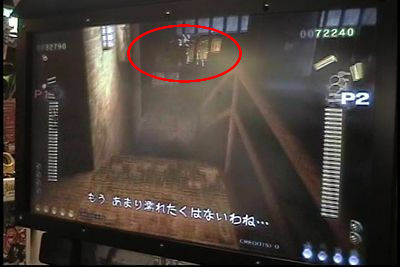 After killing the ninja and labcoat creatures, you should encounter three Zobio (strong) type creatures opening the slide, shoot the door on the left and there should be a secret room with 3 coins and a golden frog. During CHAPTER 2, cut the wire and let the enemies fall. 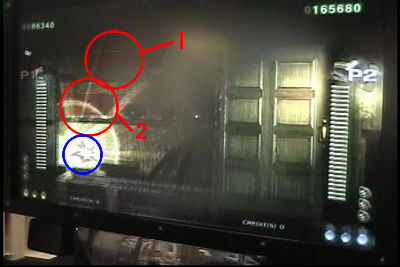 Towards the end of chapter 2, you should spot 3 burners and 3 Ebitans on a platform. Immeditatly shoot the wire. Clear CHAPTER 4 on any difficulty . Finish of Temperance. The weakspot is it’s head. Don’t get flatten. 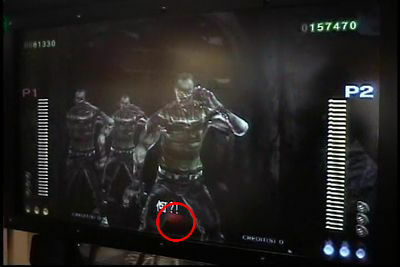 During CHAPTER 1 Boss encounter, throw a grenade and damage JUSTICE. When you encounter Justice in the sewers, throw a grenade in it’s mouth. Clear CHAPTER 3 on any difficulty. Clear CHAPTER 1 on any difficulty. Defeat Justice. It’s weakspot is the mouth. 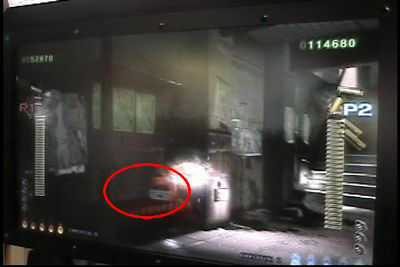 See the good ending of HOD4 SP . As the Magician trys to open Pandora’s Box, you have 10 secs to stop him. 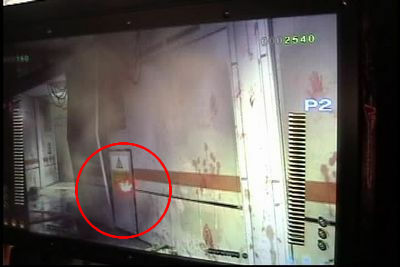 Aim and throw your grenade at the box. Shoot and destroy the BUS. Once you reached the outside the ruins of Venice, destroy the first waves of creatures. The next wave you’ll encounter a couple of strong creatures (Sandman lookalikes) and a couple of Johhnys. There should be a box containing the bus on the bottom left. Shoot it as fast as you can. 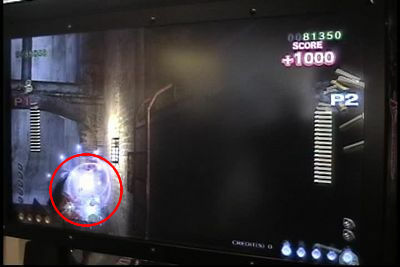 Clear CHAPTER 6 on any difficulty. Defeat The World by shooting it’s chest. Watch out for it’s ice powers. Clear CHAPTER 2 on any difficulty. Defeat the Lovers by aiming it’s small head on top of the other. Clear CHAPTER 5 on any difficulty. Defeat the Star by aiming at his scar on his chest. He’s pretty fast and watch out for his purple energy blast along with his spin attack. 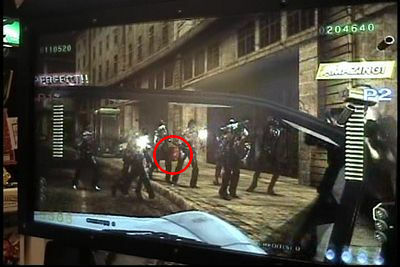 See the bad ending of HOD4 SP. When the Magician tries to open Paradora’s Box, let him and see the bad ending. Forgive me for using my Tablet to record videos. 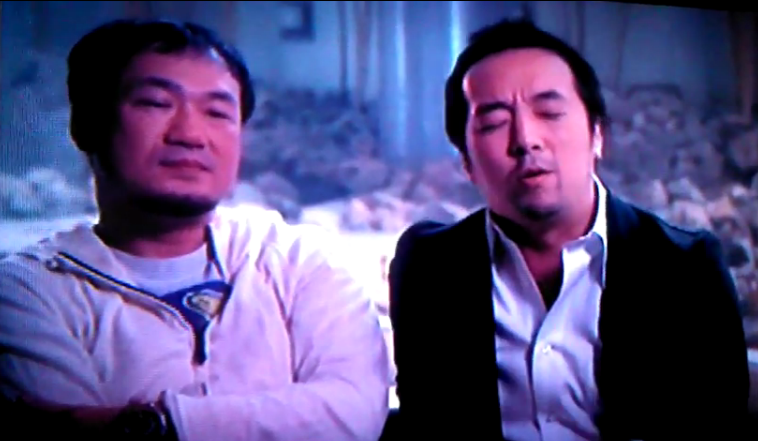 I’m in a tight budget so I can save up for the Sonic Boom event *laughs* Anyway after completing The House of the Dead 4, you are treated yet again with another behind the scenes video with the series director, Takashi Oda and producer, Yasuhiro Nishiyama. In part 2 of this behind the scenes video, they discuss how they’ve met at Sega during the merge of their development studios (Thus, becoming Sega WOW) and how they share ideas to each other to bring it out as a product to the audience of the gaming industry. They also take about the development the female lead by using Hollywood actresses as references, possibly lead the development of AMS Agent Kate Green. Nishiyama-san then compliments Takashi Oda and is luck that he’s gets to work with Oda-san on these games everyday. 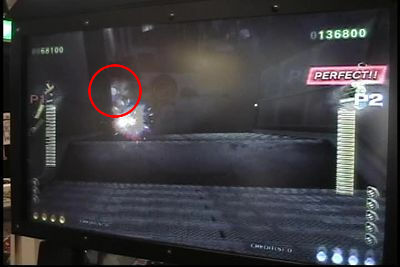 This particular enemy is noteworthy for being able to follow the player throughout the entirety of the chapter, as opposed to just showing up as the end-of-level boss. “From this initial profile, we created a suitable attack method for this large body type – rolling. 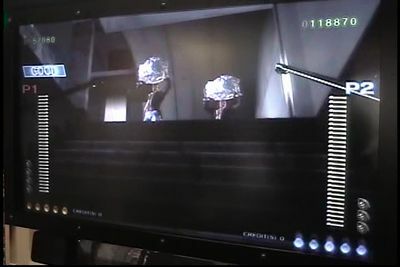 We also made full use of the game’s unique force feedback system with Temperance. Overall, we tried to make each boss encounter a unique experience for the player,” the firm added. 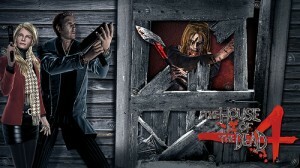 Rejoice fans as The House of the Dead 4 has finally made it to home consoles. The game is available on the PlayStation Store for only $10. However if your a PlayStation Plus member, you get a 30% discount on the game ($7 to be exact) The game features levels from The House of the Dead 4 and Special straight from the arcade version. You can use the PlayStation Move to blast through waves of evil creatures and don’t forget to bring a friend along the ride. Put an end to Goldman’s legacy and destroy the source of the creature infestation in Venice. One last thing AMS agents, don’t give up hope. Hope is such a splendid thing.